Create Unique Bridal Gifts In Stark County, Ohio at Canal Fulton Glassworks Jewelry Making Classes! June is the perfect time of year to host a wedding, celebrate a birthday, or find a new hobby in Stark County, Ohio. What do you need for all of these? Something meaningful.With the help of Canal Fulton Glassworks, you can learn to make beautiful metal jewelry and glass works that are ideal for gift giving! Are you looking for a unique Father’s Day gift for dad this year? Canal Fulton Glassworks is happy to offer their hot glass classes where you can learn to make a glass paperweight your father will love to show off on his Wooster, Ohio desk! Are you more worried about what to get your bride as a wedding gift this June? When looking for a unique bridal gift, consider making something from the heart. Glass pendants and beads can be created in their glass classes, but Canal Fulton Glassworks also offers affordable jewelry making classes. Here, you can make bracelets, necklaces, and earring sets that your bride-to-be will love. From metal to glass, Canal Fulton Glassworks has something for everyone in the Massillon, Ohio area this summer! It’s always fun to visit a local art gallery in the Cuyahoga Falls, Ohio area, but we’re often so enamored by the pieces we see that it’s disappointing to learn they can’t be purchased. However, Canal Fulton Glassworks has solved this issue by combining their gallery and gift shop so that visitors to their facility can actually buy the beautiful works of art that catch their interest. 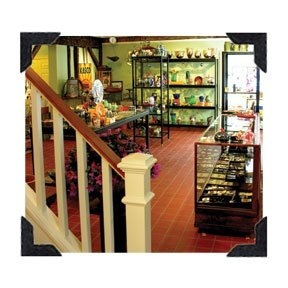 With an extensive selection of blown glass and ceramic art, handmade jewelry, wooden gifts and more, visitors from Stow, Ohio and Tallmadge, Ohio are able to peruse a wide variety of unique décor and presents for loved ones. There are a few times a year that couples have a day designated just for them. With Valentine’s Day coming up, consider creating a personal Valentine’s Day gift for the one you love at Canal Fulton Glassworks in Stark County, Ohio. With multiple classes available to take for beginners and above, you can learn glass crafting skills while making amazing items at the same time! If you’re in the Wooster, Ohio or Massillon, Ohio area, make Canal Fulton Glassworks the perfect place to create your next gift, such as a beautiful glass pendant. With your selection of colors and patterns to create a special pendant, it will make for the ideal gift for any holiday or birthday! You can even take classes to make handcrafted metal jewelry at Canal Fulton Glassworks!